Here is what I'm trying to do: I'm developing a Node.js http server, which will hold long connections for pushing purpose(collaborate with redis) from tens of thousands of mobile clients in a single machine. At the first time, I used "express" module, with which I could reach about 120k concurrent connections before swap being used which means the RAM is not enough. Then, I switched to native "http" module, I got the concurrency up to about 160k. But I realized that there are still too many functionality I don't need in native http module, so I switched it to native "net" module(this means I need to handle http protocol by myself, but that's ok). now, I can reach about 250k concurrent connections per single machine. How can I reduce the memory usage so that increase the concurrency farther? I'm really confused about how to calculate the memory usage of Node.js process. I know Node.js powered by Chrome V8, there is process.memoryUsage() api and it return three values: rss/heapTotal/heapUsed, what's the difference between them, which part should I concern more, and what's the exactly composition of the memory used by the Node.js process? I worried about memory leak even though I have done some tests and there don't seem to be a problem. Are there any points I should concern or any advises? I found a doc about V8 hidden class, as it described, does that mean whenever I add a property named by clientId to my global object pendingClients just like my codes above, there will be a new hidden class be generated? Dose it will cause memory leak? 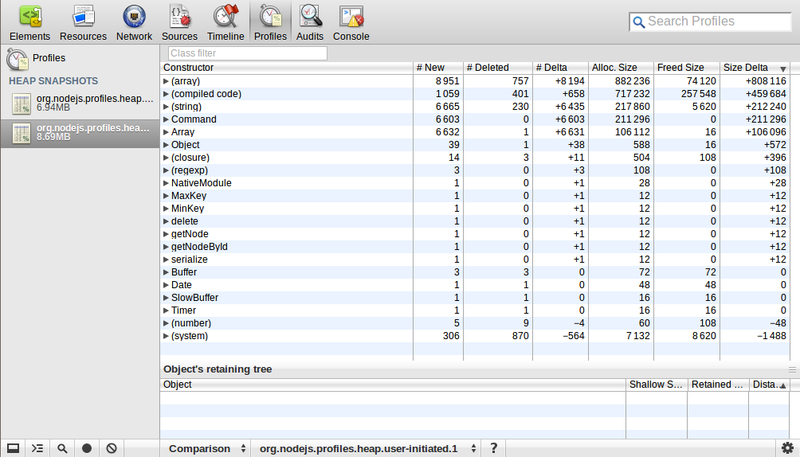 I used webkit-devtools-agent to analyze heap map of the Node.js process. I started the process and took a heap snapshot, then I sent 10k requests to it and disconnected them later, after that I took a heap snapshot again. I used the comparison perspective to see the difference between these two snapshots. Here is what I got: Could anyone explain this? The number and size of (array)/(compiled code)/(string)/Command/Array increased a lot, what does this mean? EDIT: How did I run the loading test? 2. Secondly, I wrote a custom simulate client program using Node.js, since most load test tools, ab, siege, etc, are for short connections, but I'm using long connections and have some special requirements. 3. Then I started the server program on a single machine, and three client program on the other three separated machines. EDIT: I did reach 250k concurrent connections on a single machine(2GB RAM), but turned out, it's not very meaningful and practical. Because when a connection connected, I just let the connection pending, nothing else. When I tried to sent response to them, the concurrency number dropped down to 150k around. As I calculated, there is about 4KB more memory usage per connection, I guess it's related to net.ipv4.tcp_wmem which I set to 4096 16384 33554432, but even I modified it to smaller, nothing changed. I can't figure out why. Am I right? How can I reduce the memory usage in both aspects? If there are anywhere I didn't describe well, let me know, I'll refine it! Any explanations or advises will be appreciated, thanks! I think you shouldn't worry about further decreasing memory usage. From that readout you included, it seems you're pretty close to the bare minimum conceivable (I interpret it as being in bytes, which is standard when a unit isn't specified). This is a more in depth question than I can answer, but here's what RSS. The heap is where dynamically allocated memory comes from in unix systems, as best I understand. So, the heap total seems like it'd be all that is allocated on the heap for your usage, whereas the heap used is how much of what's allocated you've used. This snapshot seems reasonable. I expect some of the objects created from the surge of requests had been garbage collected, and others hadn't. You see there's nothing over 10k objects, and most of these objects are quite small. I call that good. More importantly, though, I wonder how you're load testing this. I've tried to do massive load testing like this before, and most tools simply can't manage to generate that kind of load on linux, because of the limits on the number of open file descriptors (generally around a thousand per process by default). As well, once a socket is used, it is not immediately available for use again. It takes some significant fraction of a minute, as I recall, to be usable again. Between this and the fact that I've normally seen the system wide open file descriptor limit set somewhere under 100k, I'm not sure it's possible to receive that much load on an unmodified box, or to generate it on a single box. Since you don't mention any such steps, I think you might also need to investigate your load testing, to make sure it's doing what you think. passes two arguments to 'request', but your request handler really only needs the response 'res'. while your amount of actual data remains the same, having 1 less argument in the 'request' handlers arguments list will save you a reference pointer (a few bytes). But a few bytes when you are processing hundreds of thousands of connections can add up. You'll also save the minor cpu overhead of processing the extra argument on the emit call. How much memory does an inet stream socket use in Node.js? How to calculate node.js socket buffer to avoid allocating memory and never using it? What is the best way to avoid “system out of memory” in node.js?